Want to look up “thaumaturge” while on the train? Then you will need a dictionary app or software for a computer. Dictionary apps make looking up words speedy. They are also highly adept at providing synonyms, word histories and associations. 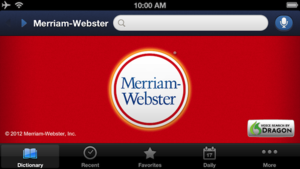 Dictionary apps have seen a surge in recent years thanks to an increased demand. They will display the meanings for any dubious word you encounter as you read or study. There are numerous such apps on online markets. So it can be difficult to pick the best one for your platform. The app counterpart to the Free Dictionary.com is massively popular on both Android and iOS platforms. The dictionary combines a thesaurus, and you can get the whole package for free. The Free Dictionary includes millions of definitions sourced from such reputable titles like the American Heritage Dictionary and Roget’s Thesaurus. The app is available offline. Some translation services to 40-plus languages are available too. What’s more, users can freely access additional services like the “word of the day” and a medical dictionary. This dictionary sources hundreds of thousands of definitions from WordNet. But that’s not why it’s popular. This app offers an array of search options to look up word meanings quickly and conveniently. You can use your phone’s camera to look up words. It even has a voice search function. Have a word in mind but not sure how it’s spelled? This app has a “fuzzy filter” that lets you use a “?” to replace a letter in search. Overall, this is an extremely convenient dictionary app to use for people who need advanced search. Dictionary.com is the most popular reference website in the world. The site’s accompanying dictionary app is just as convenient and essential. The app is available for free for iPhones and Android phones. The app has a distinct advantage over the website in that it works offline. The interface of the app is very colorful and appealing. Icons are easy to use, and the app can suggest words to type. The app provides comprehensive meaning and pronunciation information just like the website does. Some features like voice recognition have a lag and work only online. Other than minor issues, this is definitely the best dictionary app anyone can download. From one of the world’s most recognized dictionaries comes with easy-to-use dictionary app. This app is less cluttered that Dictionary.com’s. The design is minimalist overall. The app offers all the essentials like work suggestions and simile examples. The only downside is that there are onscreen ads. Using an ad-blocker can temporarily fix the ad issue though. This is definitely the best dictionary app for the Android platform. It is free, works offline, and is surprisingly simple to use. Word definitions are accurate to the dot. There are tap buttons that allow users to do things like highlight text and share words. Word entries are based on Wiktionary, so the total definitions are limited to about 160,000. There’s a neat trick where clicking on a word generates the correct pronunciation for that word. While there are many perks, this app does not give history behind a word’s meaning. The Oxford dictionary has the most comprehensive word and meaning list anywhere. The total number of words with entries exceeds 350,000. This includes phrases. Definitions are derived from the revered Oxford English Corpus. Definitions are accompanied by audio pronunciations as well. This is also one of the few dictionary software available for Macs. Both the dictionary app and the computer program have features like search autocomplete. Keyword lookup is also a breeze. If you are a college student or a researcher, this is definitely the best dictionary app to have for big projects. WordWeb is the most popular PC dictionary software. Now it is also available as an app. It works fast and reliably on any Windows OS. WordWeb can work offline without a problem. The app comes with 285, 000 word definitions. New lists are constantly updated. The problem for Windows is that software is not updated as soon as it should. Most people have heard of Babylon as a free dictionary app and translation software. Anyone can download Babylon for free. It is, in fact, currently one of the top-rated dictionary apps on the Play store as well as the Apple Store. Translations are reliable for most languages but don’t depend too much on it. It’s easy to get a definition or a translation with just a single clock or a tap. Currently, the app supports 75 different languages. Babylon is also compatible with a number of handheld devices. Offline translation is enabled as well. Plus, the app provides access to 1,600 glossaries and dictionaries in 12 languages. GoldenDict is the best rated and best overall dictionary software for Linux. It works on Android smartphones as an added bonus. The software uses a WebKit to check the accuracy of articles. It currently supports a number of dictionary file formats like .BGL, .DICT and .DSL. Convenient tools like Wikipedia are also supported. For Linux users, there really is no better dictionary program than this one. Most dictionary apps give word definitions. This is the only one to advance into providing definitions for complicated phrases and idioms. This app will be extremely useful when writing term papers, doing academic research and for certain work-related tasks as well. The number of idioms and phrases are limited to about 4,000. But it’s still useful, especially for non-Native speakers. The dictionary is completely free to download. The interface is type friendly and will not cause hassles. This is a great app to accompany a conventional dictionary app. If you are looking for the right meaning of a word, it’s worthwhile to know where a dictionary app sources its lexical meanings from. For example, if the definitions come from online submissions, then the app might not be very good. Ideally, find a dictionary that uses definitions from established sources, like the Oxford dictionary or the American Heritage dictionary. It’s common for most apps to use multiple sources for word meanings. You can read the most established definitions for complex English words from a dictionary app with good sources. Otherwise, you might not be able to rely on the definitions. English dictionaries sometimes specialize in giving meanings in a subfield or genre. Are you looking mainly for legal, medical, or idiomatic terms? If so, you might need specialty app like a medical dictionary or a slang dictionary. Meanings for certain terms typically not used in general written English only appear in these specialised dictionaries. Slang words in spoken English rarely appear in dictionaries. That is, unless you choose a special dictionary for slang meanings. So think carefully about what you need the dictionary for. Then choose the best dictionary type for your requirements. Dictionaries have a surprisingly large number of features, which you may not initially think you need. For example, the best dictionary apps show a “Word of the Day,” so you can learn a new word every day. Other such features include voice search, pronunciation aids, and searchability functions. The latter is important when you want to look up words with spellings you are unsure of. Do you want to use the phone’s camera to scan a word and look up its meaning? Cool features like this can vary from app to app. You can do a side-by-side assessment of such features before choosing the app you want. Remember, these features amazingly enhance the use of a dictionary app. Obviously, the dictionary app you need would have to be compatible with the operating system on your phone. Not all apps are cross-platform compatible. While a lot of apps are available on both Android and iOS, keep in mind that the functionality of these apps could change between the operating systems. A popular Android dictionary app may look slightly different on an iPhone. It’s best to choose a top-ranking app based on specific platforms. Otherwise, you might have to deal with annoying compatibility issues. Do you want your dictionary app to be available even when the phone is not connected to the internet? It’s a seemingly simple feature, but some apps are not available without the internet. Most of us would prefer to have a dictionary app that works with or without the internet. You can look for offline dictionary apps to benefit from this feature. Unfortunately, not all dictionary apps are free. Most dictionary apps, especially branded apps, charge a fee. Fees are mostly subscription-based. You might be able to get away with a one-time free. While free apps are desirable, subscription-based apps may offer more features. So it’s worthwhile considering the cost as well. Any one of the above mentioned apps and programs will suit business and home needs adequately. Most of the above software is free to use. However, if you are willing to pay a small subscription fee, you can squeeze more out of these apps. The English dictionary and oxford dictionary are my favourites.